Easy pedaling with the 8'2" board on a long Blue Sky Cart behind a Kettler Cycle on the sand at South Beach on Aug. 28. Pedaling on the packed sand, pavement, and packed gravel was easy. 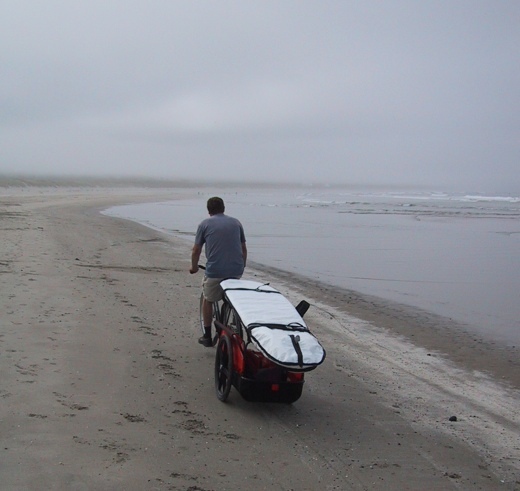 However, uphill and over the sand dunes with the 150 pounds of trailer bike and load was tough. I think it would be wise to have a waist band and tow line to pull the trailer from the hips on hills and in loose sand. Along the flats at Yaquina Bay on Aug. 27 I was able to travel at 10-11 mph, into a 10-15 kt wind my speed dropped to 8 or 9mph. There is no need for a park brake or chocks on the long cart because when the bike is laid over the cart tongue holds the back of the bike off the ground and the cart nose is fast on the ground. I was very happy to not have the wider cart on the Yaquina Bay Bridge where there is little space. Everything needed to surf and camp at South Beach State Park was in the cart. Bike and trailer at Otter Rock 9/2/05 after AM surfing small waves on a 9'4" Robert August board. Surfing was choppy the evening before at Agate beach but still good to be in the water. I stopped by Agate on the way south again where there were beautiful 3-4' lineups. 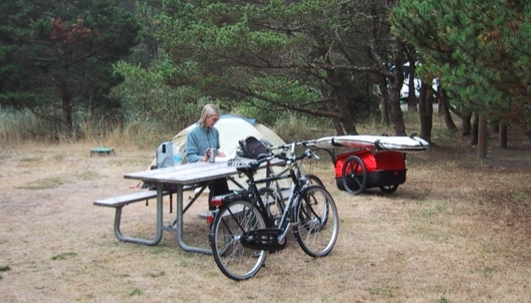 I camped at Beverly Beach where I met 5 other bicycle tourists. One man from Utah in his 60's has traveled by bicycle from Portland to San Francisco each September for the last 15 years, he loves to cycle the coast. 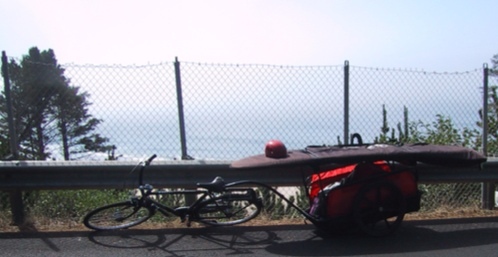 No one had ever seen a surfboard on a bicycle trailer, one younger man was carrying his gear in a "Yak" trailer. The Utah rider met a group of German cyclists riding Kettler bicycles last year. www.ridetoride.net Parking the car to make the world safer.